We provide strategic patent advisory services covering all aspects of patent monetization. We develop the strategy and execute the sale of core and non-core patent assets. We also provide buy side patent acquisition services. We develop strategies for licensing patent assets to non-infringing 3rd parties, and for licensing patent assets where there is evidence of infringement. For patents that are being infringed, we develop litigation business strategy, negotiate cost effective engagement agreements with selected litigation counsel, and provide patent litigation case management services as the business strategists between you and your counsel. We can source specialized capital to fund patent litigation. We fulfill the role of Fractional Chief Intellectual Property Officer for SME clients, for a much more attractive investment than what you would commit to a suitable full time candidate. We will help craft your patent strategy and identify patent tasks that will enhance shareholder value. 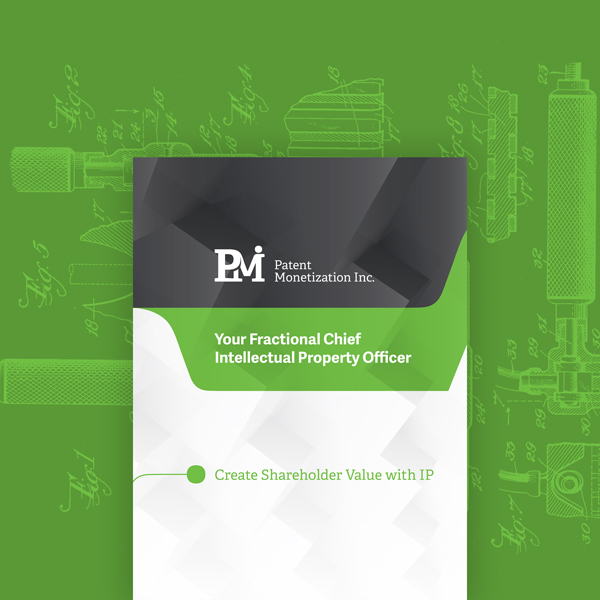 The CIPO must align an IP strategy with the overall business strategy. A by-product of the extensive patent monetization experience of PMI’s founders is that we have worked with some of the best and brightest minds in the patent world. This allows us to create a virtual network of trusted associates to assist us in providing complete strategic patent services to our clients. PMI has developed a network of trusted patent prosecution associates from legal firms throughout the US including many firms in Washington D.C. that benefit from close proximity to USPTO examiners and regularly meet with them face to face to help expedite patent applications. We know the firms that specialize in Inter Partes Reviews and contested patent litigation at the USPTO. Having several trusted associate firms to choose from we help you avoid firm conflicts and find cost effective boutique firms that may be more effective and cheaper than the IP department of your full service corporate firm. In Canada we have access to experienced patent agents that work for specialty firms as well as independent patent agents who may work on alternative fee arrangements or reduced hourly fee structures. In addition to patent prosecution professionals we also have trusted associates that are prolific inventors that can put a patent development process in place within your organization, help you determine patentable inventions and teach your R&D staff how to recognize future patentable inventions. PMI has trusted associates that combine custom intellectual asset management and patent search services with powerful web-based software solutions enabling companies to identify, analyze, manage, monitor and update patent information relevant to their technology and markets. These associates provide competitive patent landscape and prior art analysis along with proprietary patent management and monitoring software that enables companies to build strategic, defensible and valuable patent portfolios that are aligned with their business objectives. PMI has trusted associates that are experts in claims construction analysis. These associates are experienced patent litigators with strong technical backgrounds who now work independently and without the overhead of a large patent firm. PMI also has trusted associates that provide expert testimony for damages analysis in patent litigation cases. These associates are available to provide patent portfolio valuation analysis or to develop a preliminary damages model against target infringers to help determine the risk/reward profile of your patent portfolio. With our extensive experience in managing patent litigation cases, PMI has an extensive network of trusted patent litigation firms. Whether the need is for a contingency only firm, a hybrid contingency firm or a full fee for service firm we can source the most appropriate firm to fit your strategic and budgetary requirements. We can also source, either on the plaintiff side or the defensive side, the most appropriate firms that specialize in litigation at the USPTO for contested procedures, or Federal District Court litigation or Court of Appeals for the Federal Circuit (CAFC) or Supreme Court cases. Where patent portfolios exist that are not being infringed but could be licensed to third parties, PMI can use its network of patent savvy business development associates to assist in developing and implementing a licensing program.